Welcome to the Hilltops Region, located just over an hour north of Canberra in southern NSW. 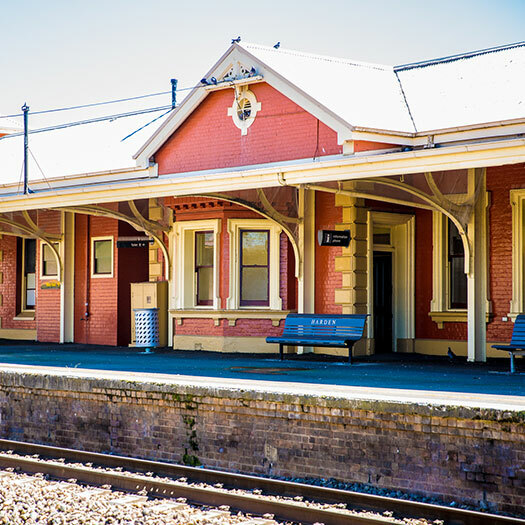 Featuring the thriving towns of Young, Harden ­Murrumburrah and Boorowa, along with a host of quaint villages bursting with history and a unique story to tell, the region is a fusion of experiences waiting to be explored. From Brisbane travel via the A39 (Newell Highway) via Dubbo and Parkes. Take the Grenfell exit at Forbes and travel via the Henry Lawson Way to Young or Lachlan Valley Way to Boorowa. Continue on local roads for Harden and Jugiong. From Sydney travel along the M32 (Hume Highway) via Goulburn and Yass. Take the Lachlan Valley Way exit for Boorowa, Burley Griffin Way exit for Harden or continue on the Hume Highway to Jugiong. Travellers to Young can proceed via Boorowa or Harden. From Melbourne take the M31 (Hume Highway) via Albury and Gundagai. from Gundagai continue on the Hune Highway to Jugiong. From Jugiong head north towards Harden. For Boorowa continue on the Hume Highway and take the Lachlan Valley Way exit shortly before Yass. 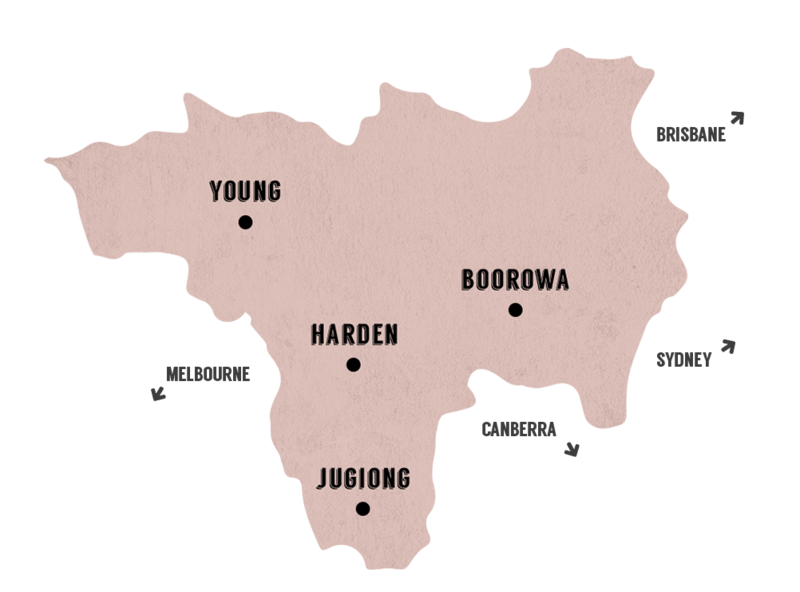 Young can be reached either via Harden or from joining the Olympic Highway at Wagga Wagga. From Canberra travel north via the A25 (Barton Highway) and join the M32 (Hume Highway) at Yass. Take the signs for Gundagai/Melbourne and either take the B81 (Lachlan Valley Way) exit for Boorowa or the B94 (Burley Griffin Way) to Harden. You can travel to Young via Boorowa or Harden. for Jugiong continue on the Hume Highway (M23) from Yass towards Gundagai. The Hilltops Region’s closest airports are at Canberra and Wagga Wagga. Sydney International Airport is approximately 4 hour drive to Young and 3.5 hours to the Boorowa & Harden areas. Harden Station is located on the main Sydney to Melbourne line. Direct services operate between both cities and other stations along the line (including Wagga Wagga & Goulburn) to and from Harden daily. To get to you Young passengers should alight at Cootamundra for onward bus services. The bus arrives in Young from either Dubbo or Bathurst at 11.35am and returns back to Young at 3.35pm from Cootamundra railway station. For more information and all enquiries about this service please contact NSW Trains direct on 13 22 32. Young Community Transport offers a same day return bus services from Young and Boorowa to Canberra and from Young to Wagga Wagga. Drop off points in Canberra are the three major hospitals, the Jolimont Interchange in Canberra City and the Canberra Airport. Drop off points in Wagga Wagga include medical institutions, the airport and University. This service to Canberra is available Monday, Wednesday and Friday, whilst the Wagga service is on Tuesday and Thursday. Bookings need to be made directly with Young Community Transport (6382 1518) or click here for more information.